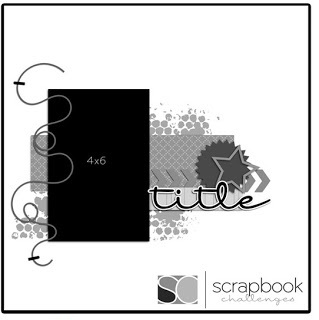 After much ummming and aahhhing I have decided to move my blog back to Blogger.Please head over to....http://melfield.blogspot.com.au/ and continue to follow my journey with scrapbooking! 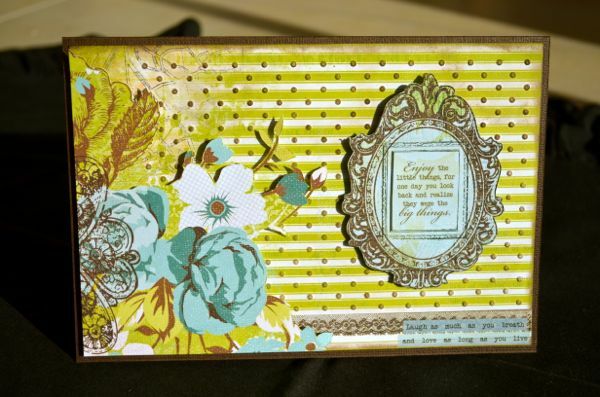 I am here today to share with you my latest layout as Design Team Maven over at Sketches in Thyme. It will only be a quick post today as I am busily making and decorating a cake to celebrate Brayden's birthday tomorrow with family. Here is my take on the #102 sketch. I apologise that this is a short post and I will attempt to get back and share a few other layouts with you from the past two weeks...it has been a little busy in my world! Well, back to the cake making and decorating! For those of you who are not Australians...today we celebrate our wonderful country! Lots of BBQs, Aussie flags, a few beers and a long weekend. We have been lucky enough to be away for the last few days. Last night we had dinner on the foreshore.....a gorgeous night it was. Today I am here to share with you two projects that I have worked on in the last little bit. 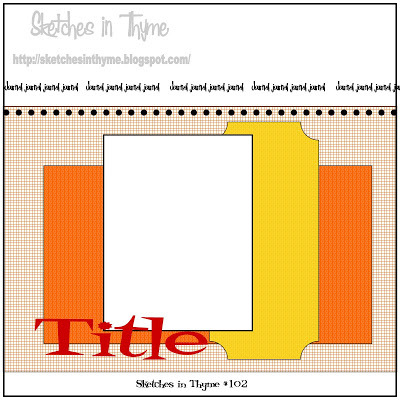 Firstly, over at Sketches in Thyme we have launched part 2 of the Sketch #100. A double page sketch. As I said in one of my earlier posts...I have made it my goal to work really hard on my sons baby album using Sketches in Thyme as my inspiration. Here is sketch # 100. 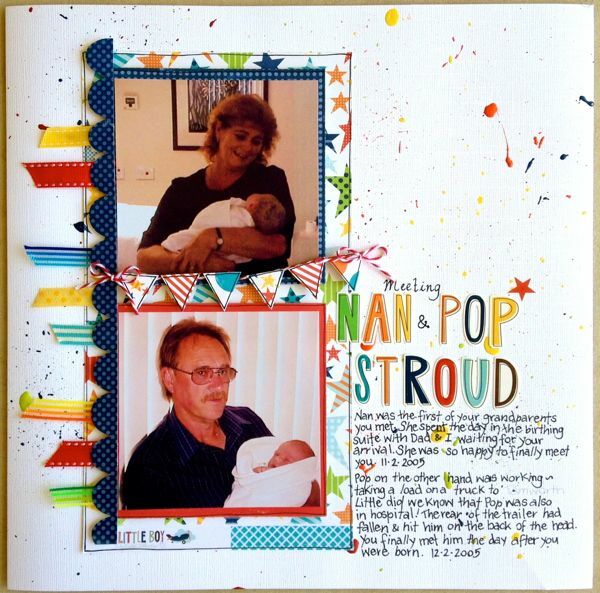 These photos were taken of Brayden and his Aunty and Uncle a short time after he was born. Do you like my cute little flowers? I cut circles with a decorative edge and then folded them. I placed them around in a circle to create the flower and then held them together with a brad. 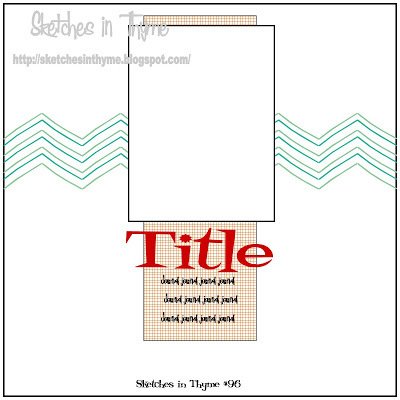 Why not pop on over to Sketches in Thyme by clicking here and check the other layouts from the DT Mavens? There is some awesome inspiration! 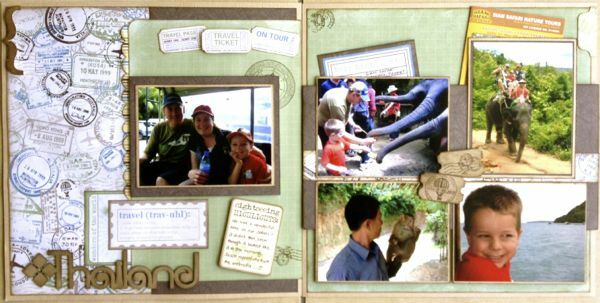 My second project to share today is a layout that I have done of our Thailand holiday. 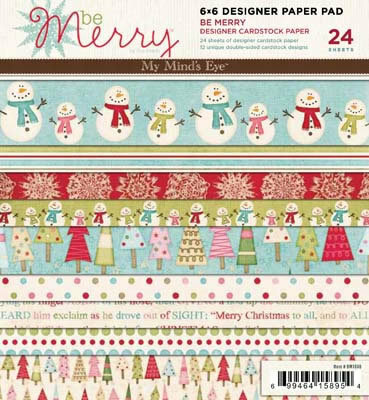 Liz (a friend of mine) had a challenge at Soul Scrappers for a layout with a holiday theme. I thought I would jump in and participate.....here is my layout. The challenge was to complete a double layout with a holiday theme using 5 or more photos. It also had to include 2 or more pieces of chipboard. I have made a little pocket behind the photos to hold the brochure and my journalling. Another layout for our holiday complete - yay! Hope you all have a wonderful Australia Day! We have taken some time out this week - spur of the minute decision. The boys have headed out in our neighbours boat ( so we are obviously not too far from home) fishing today. Meanwhile I am testing out the new van for Scrapbooking quality.....LOL! Working for me so far! 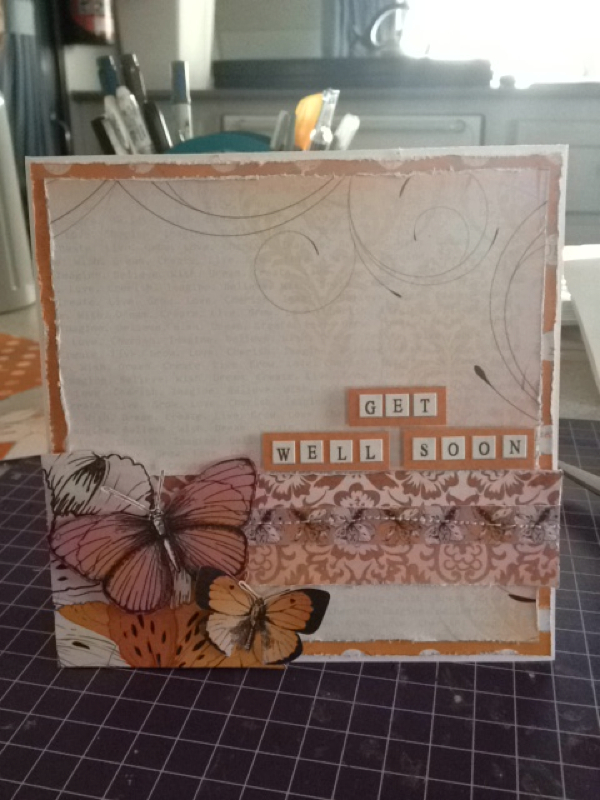 Here is a card I have just whipped up for a family friend who is unwell at the moment. I hope she likes it. This post was supposed to be published live last Friday 11th January when the Sketches in Thyme post was released! Unfortunately I have been unable to post as my Father in Law passed away last Friday morning. We have lost a very special Dad, Father in Law and Pop. He will be greatly missed but we know he is in a better place. All of our wonderful memories of him will live on in our hearts forever. Well, what a start to the 2013 year! I hope that yours has been a little less frantic than mine and you have had some "Me Time" in your day. Sketches in Thyme has started off the year with a bang! Sketch #98 went up last week and wow! What talented ladies we have on the team! Today Sketch #99 goes live on the blog....and it is my turn. Big shoes to fill that is for sure! I really loved working with this sketch and I stuck closely to it. Not a lot of change from the sketch to my layout. One of my goals this year is to work hard at pulling together a more completed version of my son's baby album. He is nearly 8 so I thought it was time!!!!!! 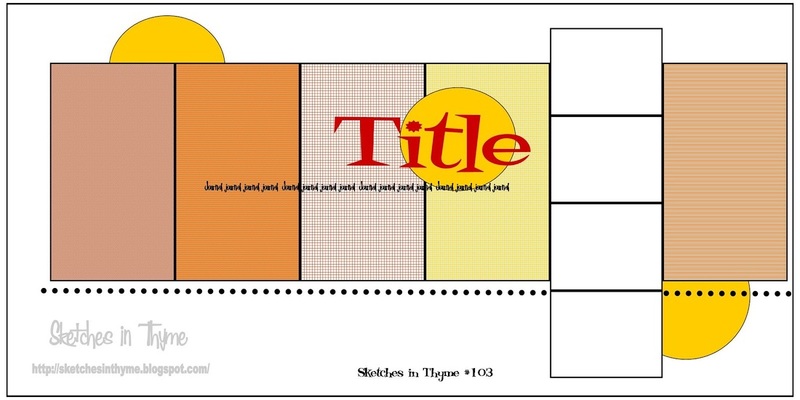 So, most of my layouts for Sketches in Thyme will have something to do with the baby album. I loved working with this sketch so much that I decide to do two very similar layouts using this sketch....one as per the above sketch and the other I flipped the sketch over. 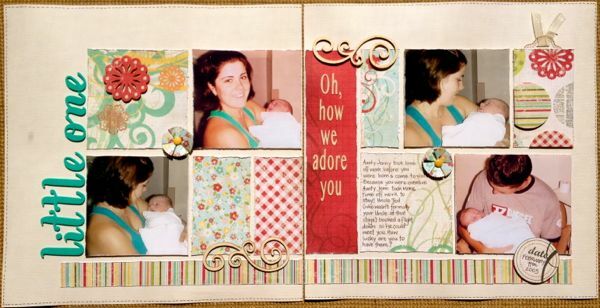 For both of the layouts I have used the Echo Park 'Little Boy' collection. I just love the bright, happy colours...great for such an exciting celebration! 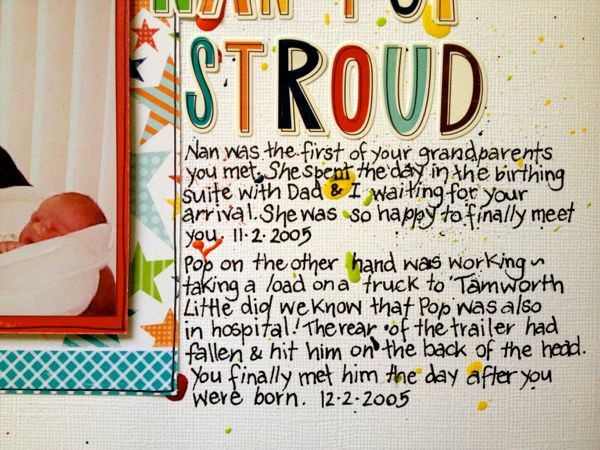 A story goes along with 'Meeting Nan and Pop Stroud' which is detailed in the journalling...hence the large amount of journalling. 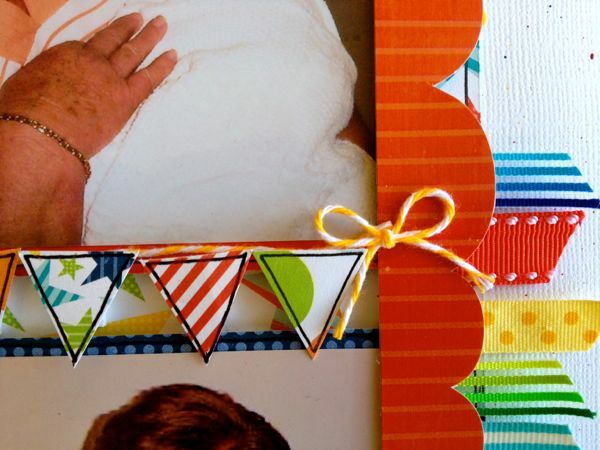 And here is a close up of a little part of the bunting. Make sure you head over to Sketches in Thyme (if you haven't already) and check out the rest of the Mavens beautiful work. Remember to pop by their blogs and leave them some love too! Well can you believe that there is only 8 days until Christmas???? I apologise for my slackness posting this post here but life has been very hectic! As always over at Sketches in Thyme there are lots of awesome sketch challenges to play along with. 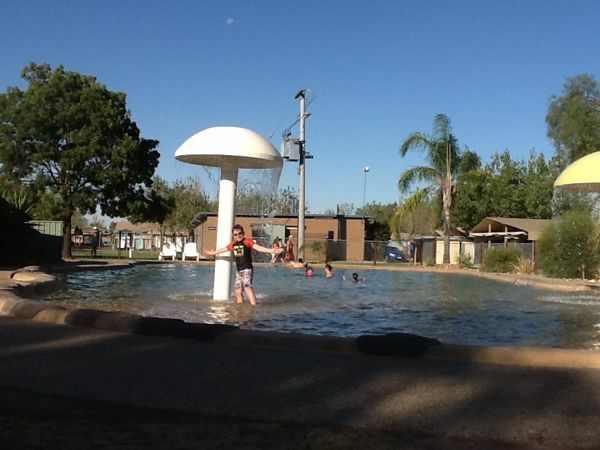 On Friday our second layout for the month was launched. Sketch #96. There is also a prize up for grabs. 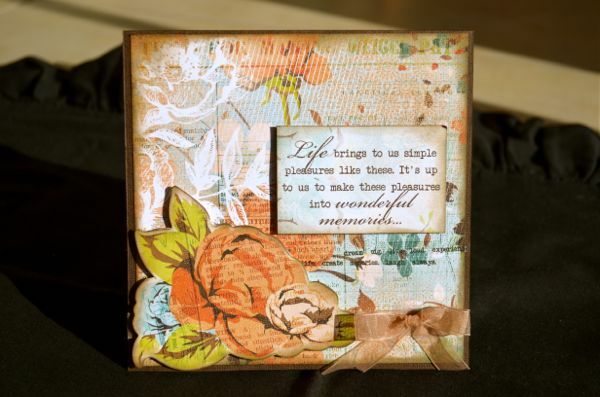 To be in the running to win the little prize you need to enter a layout this month at Sketches in Thyme. Such a great sketch and very easy to work with. 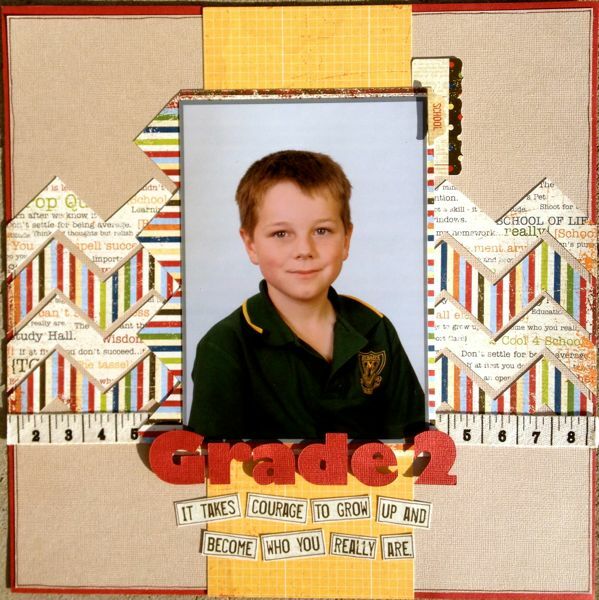 Each year I create a double page layout for Brayden's school album. Part of this double layout is a zip feature to store any certificates, sporting ribbons, extra special bits and pieces. When I saw this sketch I thought immediately of using it for Brayden's Grade 2 layout which I hadn't started at that point. Whilst I haven't completed the other half of the double I am well on my way with half completed for this sketch. I have used the Simple Stories Elementary collection. It is such a bright school collection. 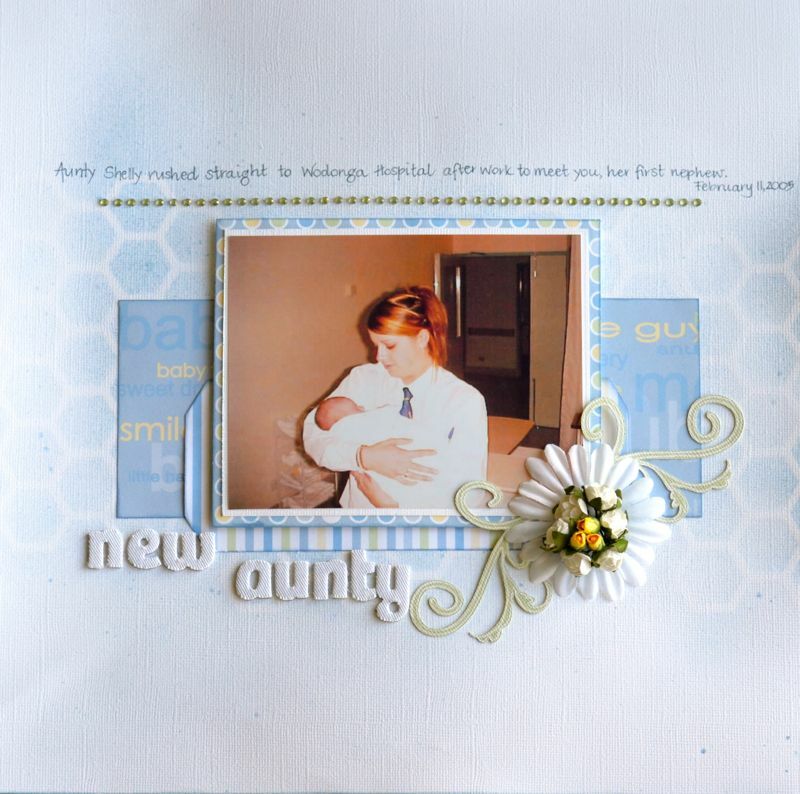 I am loving my Silhouette Cameo so much! 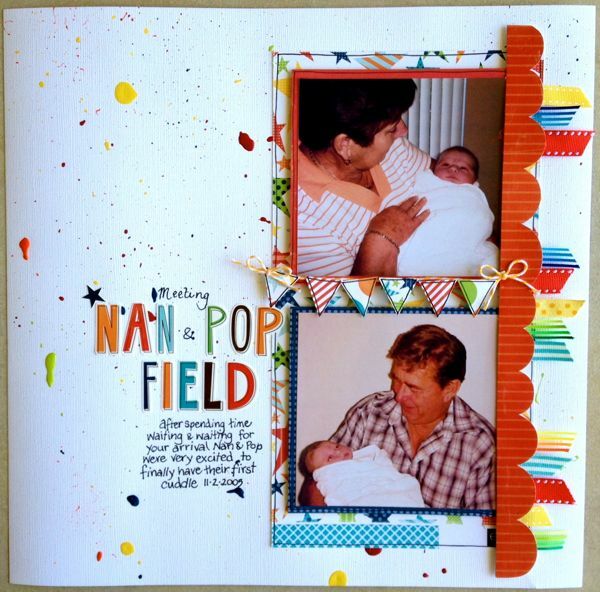 It was so easy to cut simple things like the zig zag strips and the title on this layout. 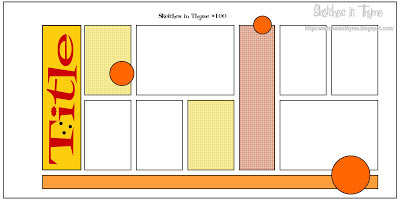 Anyway, why not pop on over to Sketches in Thyme to check out the other layouts from the Mavens. I am off to get the last week of work started.....bring on holidays!!! !